There is an opportunity for you and your colleagues to serve nursing education and the nursing profession by becoming a peer evaluator. The ACEN is growing; the number of site visits per semester has increased from an average of 80 visits to 120 visits. Your ACEN needs you to volunteer to be a peer evaluator. Every ACEN-accredited nursing program benefits from having at least one nurse educator serving as a peer evaluator, and there is no limit to the number of peer evaluators from a nursing program. Many consider serving in the role of peer evaluator as an opportunity for service and as a professional commitment. Nurse administrators, nurse educators, and nurse clinicians are the essential subject matter experts and the driving force in the ACEN peer review process. 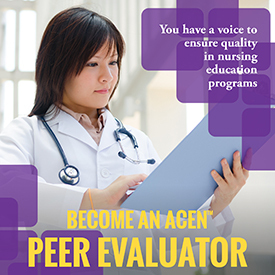 Peer evaluators serve ACEN-accredited nursing programs in every stage of the peer review process and are committed to strengthening the quality of nursing education through accreditation. Complete the online nomination process and submit the eligibility information. Once eligibility is established, you/your colleagues will receive an email with a secure web link to complete online peer evaluator training at your convenience. The training is available 24/7 and will take between 4–6 hours to complete. Once the training is complete, you/your colleagues will earn 5.75 CEUs and will be eligible to serve as a team member on a site visit team. Each peer evaluator is asked to serve only one (1) team per year; although, many choose to serve more often. Travel, lodging, and food expenses are paid for by the program undergoing the review process. Therefore, this service will not cost anything except you or your colleagues’ time.